Barely 20 km from the town of Rameswaram in Tamil Nadu, Dhanushkodi gets its name from Dhanush (bow) and Kodi (end). The name alludes to an anecdote in the Ramayana, where Lord Rama broke the bridge constructed by his army of monkeys between the mainland and the island of Lanka with a stroke of his bow. 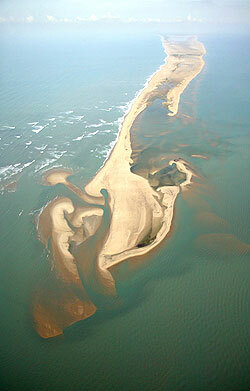 Barely 50 yards long, Dhanushkodi is the sole terrestrial border between India and Sri Lanka. It was inhabited until 1964, when a terrible cyclone wrecked the village and swept a passenger train into the sea. 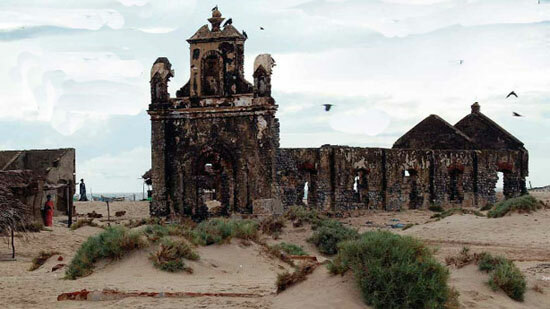 Though Dhanushkodi today is a ghost town, it is still visited by pilgrims. On the fateful night of December 22, 1964, Indian Railways train number 653, the Pamban-Dhanushkodi Passenger, left Pamban with 110 passengers and five railway staff. It was only a few yards before Dhanushkodi railway station when it was hit by a massive tidal wave. The train was washed away, killing all 115 on board. In all, over 1,800 people perished in the cyclonic storm. Following this disaster, the town was declared unfit for living. Thus this is a holy place for Hindus, further made holier by the confluence of two sea bodies, The bay of Bengal and Indian ocean. Today, 48 years later, the structures that withstood the tidal wave still exist buried under the sand and some partly weathered by the Sea adding a mysterious beauty to the place. A few fishermen have settled here in thatched huts and life goes on for them unaware of tomorrow. Of late, I read in a magazine that the sea water is slowly receding and some parts of the submerged town are visible. I haven’t visited Rameshwaram and Dhanushkodi, but it is on my ‘to do list’ to see and experience how it feels, standing at the land mass which is at the tip of India. Many tourists who travel to Rameshwaram are unaware of Dhanushkodi and the ones who visit sing praises about its its beautiful coral reefs and rich marine life which is supposed to be very active here since the ocean waters are very shallow. It is also the birth place of our ex President and missile man APJ Kalam. and this is also the town through which Swami Vivekananda entered India Via SriLanka after his famous Chicago conference. A port, a holy town, nature lover’s paradise that was (is) Dhanushkodi. Mark it next time around Rameshwaram. By road: Buses and taxis conducting regular service between Madurai and Rameshwaram. From Rameshwaram you have to hire private vehicles through the sands. Local transport: Inside the city walls of Rameshwaram, you can hire a jeep or an auto rickshaw.